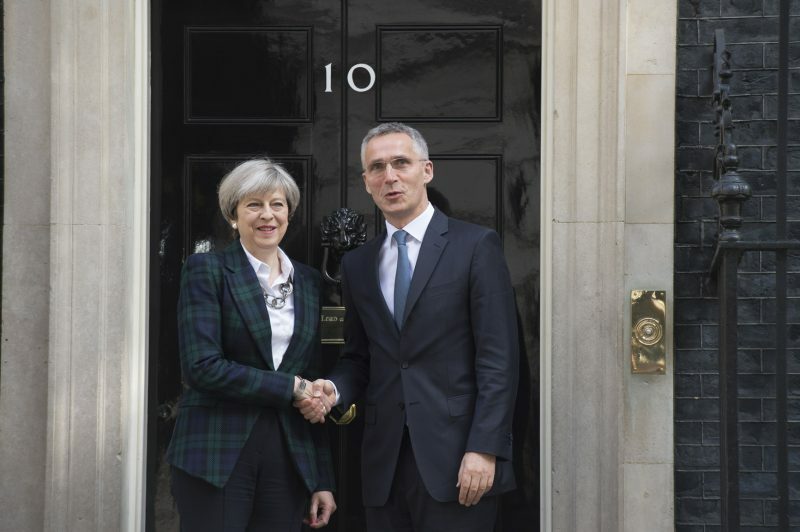 Pictured: NATO Secretary General Jens Stoltenberg and Prime Minister Theresa May outside the front door of No. 10 Downing Street when they met to discuss defence issues in May. Mrs May is proud of the UK spending the NATO minimum of two per cent of GDP on defence, though there is no doubt British front forces have been hollowed out. Photo: NATO. Mr Corbyn, whose anti-nuclear and anti-NATO views are well-known, at the beginning of the election campaign showed himself during a car crash television interview to be totally unsuitable to be entrusted with Britain’s defence. In the interview, when confronted with a highly specific scenario, he could not commit himself to authorising a strike against terrorist leaders. Subsequent events – the two terrorist attacks in Manchester and London – in which 29 people lost their lives and more than 100 were injured forced Corbyn to strongly condemn terrorism and those perpetrators. Yet in the past Mr Corbyn has refused to unequivocally condemn IRA bombing campaigns. The IRA was a terrorist organisation that killed hundreds of civilians and British military personnel. His refusal to outright condemn their actions is particularly shameful for a man vying to become ultimate boss of today’s UK Armed Forces. On certain issues Corbyn comes across as a man who would say just about anything to get elected, leading a party that will promise just about anything to gain office. He is amazingly vague and non-committal about matters of Defence. While Corbyn was the only party leader to specifically mention the crisis in British maritime forces – pointing out that Britain is short of frigates and maritime patrol aircraft – his wooliness on Trident nuclear deterrent does him no credit. It suggests a man who is hiding what he really thinks. After all Mr Corbyn is an inveterate anti-nuclear campaigner and, in effect, a pacifist who even opposed Britain liberating the Falklands from occupation by a fascist Argentinean regime in 1982. That he has pledged himself to never pressing the red button means that at the moment Prime Minister Corbyn walks through the front door of 10 Downing Street, the UK’s nuclear deterrent is neutered and pointless. Potential foes will discount it from any future calculations in acting against the UK or its interests overseas. Corbyn either genuinely does not understand how deterrence works or he is, again, being deliberately disingenuous so he can get into Government and then abolish the UK deterrent (which was has always been his aim). Whether or not he would then give orders to regenerate the conventional forces remains to be seen. For all his talk of frigate and patrol aircraft shortages it seems most unlikely given his pacifist stance. There have been strong claims by the Tories that they are the party of Defence, which in reality do not hold water. Historically, Tory governments since the end of WW2 have not been good for the UK Armed Forces and certainly not for the Royal Navy. The Thatcher government in the early 1980s, via the Nott defence review, a tragically misguided effort, posed the most notorious threat of the Cold War era to a viable Royal Navy. The Nott review played a part in causing the Falklands War by projecting British strategic weakness. The recent governments led by Tory PM David Cameron have caused deep and lasting damage to the RN even as the world has grown more dangerous, inflicting the kind of damage the Nott review failed to achieve. The Govts led by Mr Cameron piled inept cuts on top of Tony Blair and Gordon Brown’s earlier (Labour government) salami slicing of UK military capabilties and unwise long-term land war commitments. Mrs May was part of the UK Government when the Strategic Defence and Security Review (SDSR) of 2010 and its 2015 successor were agreed. So called ‘homeland security’ was boosted but the defence budget was effectively cut even further. Counter-terrorism has become conflated with strategic Defence, leading to a situation where the former leeches funds away from the latter. Following the Manchester and London attacks this will probably happen again, with Peter robbed to pay Paul, with the consequences of even weaker national defences at a time when conventional (state) threats are rising inexorably. Military spending in Britain will, according to the Tories, get annual increases until 2020 to achieve the NATO minimum defence spending target of two per cent of GDP. However, the books have been cooked, with elements that are not connected to actual Defence of the nation inserted into the calculations. In truth the UK spends less than two per cent GDP on forces that defend the nation. Additionally, when he was Chancellor of the Exchequer, the current Editor of the London Evening Standard newspaper (George Osborne) put the capital costs of regenerating the nuclear deterrent into the Defence budget for the first time. He did this despite Trident being a political-strategic and diplomatic tool and not a military capability. It diverts even more funds away from front line capabilities. If a UK Govt wanted to deliberately devise a structure that ensures Britain can no longer project power or protect itself properly it could not create a worse model. Theresa May has not changed any of these aspects, nor does she show signs of wanting to, along with a seemingly poor grasp of detail on the overall hollowing out of the UK Armed Forces and the Navy in particular. When it comes to matters of Defence leadership, both Mrs May and Mr Corbyn are weak and are not offering the kind of radical policies, one way or the other, that would make their parties ‘the Party of Defence.’ All that can be said in favour of the Tories is that they are the least worst option in terms of strategic defence. When it comes to conventional deterrence they are failing to meet the challenge and do not seem to have any solid plans to change things.